A few weeks back while driving through picturesque New London, PEI with my dear mama, we happened upon a new (to us at least!) little shop called New London Joy. We stopped in and found a treasure trove of pretty porcelain dishes, antique furniture, vintage jewelry, as well as some beautiful glass tile mosaics. 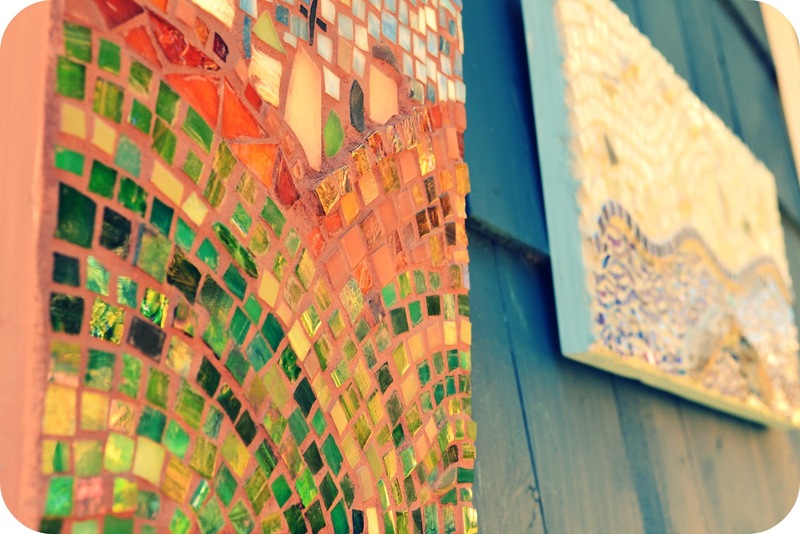 As we chatted with the friendly folk staffing the shop, we found that there were workshops throughout the summer with owner and artist behind the mosaics, Roseann Barry. 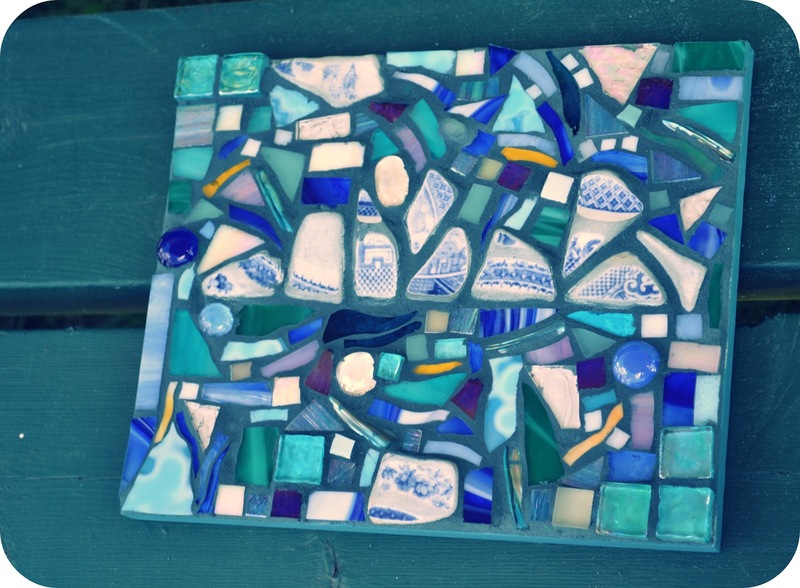 The last time I'd made a mosaic was in high school art class, but I really enjoyed it at then, and the possibility of re-learning the medium appealed to me, so I decided to signed up for one of the two day workshops. On Thursday morning I headed to New London to get started on the first day of the workshop, and was joined by my fellow students - a pair of sisters from Calgary, and a lovely couple from Maine who had the most fantastic accents! I discovered to my delight that all four others frequently summered on PEI - I am always so happy when people from away love my island as much as I do! It also helped that everyone was so friendly, making for enjoyable conversation and laughter as we worked. Roseann introduced herself and set us loose in her treasure trove of shimmering glass in every possible colour and texture. 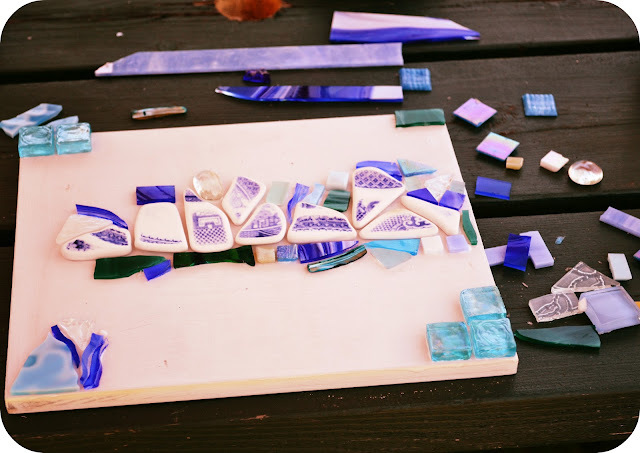 All five of us eagerly set about choosing the perfect pieces, and I personally gravitated towards shades of blue and teal, being initially inspired by tumbled pieces of an old broken plate (the patterned white and blue pieces above). Following a lesson in cutting our glass into different shapes, I sat down with the group in the summer sunshine to arrange and glue my pretty pieces of glass into the perfect pattern. Throughout the afternoon we were visited by almost everyone who stopped in to the shop, as we were outside at a picnic table. Roseann patiently guided us and reassured us all in our attempts at creativity and by the end of the day, we all had boards filled with glass, ready to fill in with grout the following day. On Friday I headed back out, eager to see how my mosaic would look after being filled in with grout, cleaned up, and polished to a shine. We chose complimentary colours of grout that would best suit the colour palettes of our individual pieces. After mixing them to the perfect shades (I went with a mix of blue and green), got to work filling in the empty spaces. It was so fun to watch not only my own piece come together over the two days, but also to see all of the others too. Everyone had come up with such different mosaic ideas, but they all ended up turning out so well - which was so satisfying! After cleaning off the grout, painting some touchups on the back and sides of our boards, and preparing them to hang, we all excitedly got together for a group photo with our completed work. This last photo is of my finished piece - grouted, polished, and ready to go! I'm really happy with how it turned out, but now my dilemma is where to hang it! But I'm sure I'll find a spot eventually. 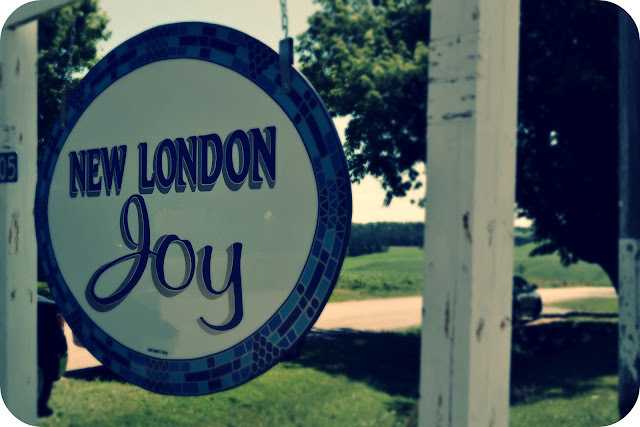 If you're an islander, or will be visiting PEI this summer, have a peek at the New London Joy site, and check out the times and dates for the other workshops happening. Not only is it a seriously enjoyable experience you come away from with a ready-to-hang piece of original art, but all proceeds from the course fees go to an incredibly worthy cause - the PEI Mental Health Association's Teen Suicide Prevention program. Absolutely worth every penny! If any of you actually do end up participating, please send me a photo of your finished piece - I'd love to see! Sounds like so much fun! Love how yours turned out! So pretty! I'd love to try making one at some point! What a cool project - yours turned out so well! I'm stopping by for sure when I am in PEI in September. Also sent it to a friend who will be there in August! Thanks so much, your piece is lovely, it reminds me of beach glass.